Fuelled by French buyers benefiting from the advantageous exchange rate, bids for revivalist furniture have been consistently strong in recent months. As reported in these pages last week (ATG No 2331), a French dealer went to a triple-estimate £4800 (plus 20% premium) for a pretty escritoire at Mallams Oxford at the end of January. Two sales held by Reeman Dansie (20% buyer’s premium) at Colchester on February 13- 14 and at Canterbury Auction Galleries (20% buyer’s premium) on February 6-8 produced more French action. At the wide-ranging 1140-lot Canterbury sale, the top furniture seller was a late 18th or early 19th century French kingwood and gilt brass-mounted rectangular bureau plat of Louis XV design. A good provenance took it back to Francis, Lord Jeffrey, Lord Advocate of Scotland (1773-1850). He acquired the desk in 1801 and used it to write articles for the influential magazine Edinburgh Review, of which he was editor. However, it was quality rather than legal and literary history which triggered a competition between bidders from France and Germany, with victory going to the French trade at £6000 against a £2500- 3500 estimate. The quality of the material from a local country house offered by Reeman Dansie would – said furniture specialist Daniel Wright – have attracted interest from any good furniture dealer. The best-seller went to the French trade, however. This was a Louis XVI period breakfront kingwood commode with ormolu and fine porcelain mounts. The 5ft 5in (1.65m) wide marble top had a break and there was some splitting and lifting to the veneers, but it was in good, original condition and, against a £4000-6000 estimate, it sold at £8800. From the same deceased estate came a 19th century French ebony and marquetry inlaid and ormolu-mounted bureau plat. Its 4ft 8in (1.42m) wide serpentine top was decorated with marquetry borders depicting heraldic devices, musical and scientific instruments. It had a few condition issues commensurate with age – fading, some veneer loses and cracks – but it improved upon the £1500-2000 estimate to sell at £5400. 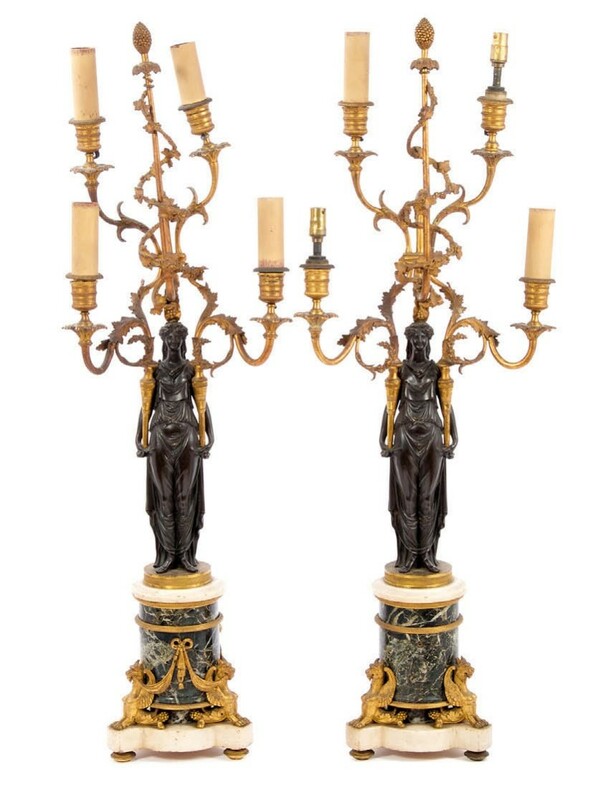 An exuberant companion to either piece was apair of 2ft 8in (81cm) tall French Empire bronze, ormolu and marble four-branch candelabra. Both were very dirty and had undergone minor repairs and the ormolu swags were missing from one plinth. Now converted to electricity, the pair more than doubled the top estimate, going to the trade at £4500. 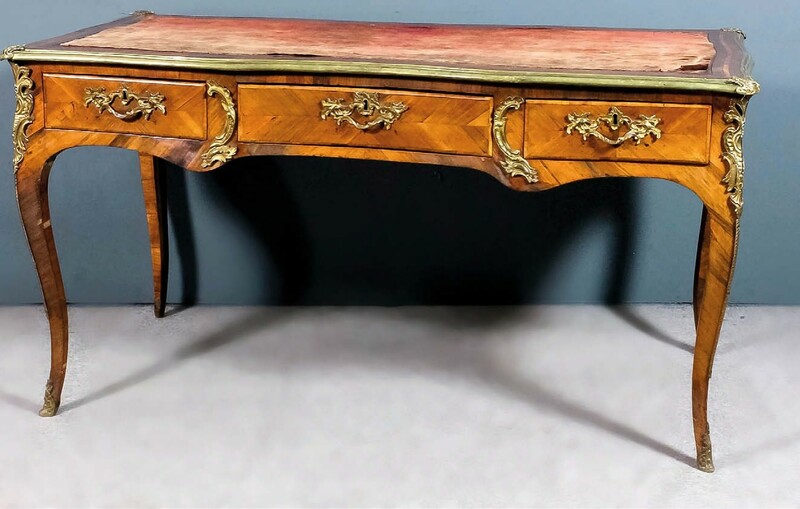 George II walnut crossbanded and line-inlaid estate desk – £3700 at Reeman Dansie. Flying the flag for English furniture were a George III mahogany and parquetry inlaid breakfront bookcase and a George II walnut crossbanded and line-inlaid estate desk. The 7ft 5in x 7ft 6in (2.25 x 2.29m) bookcase with some fading and historic restoration had four astragal glazed doors, each with an ivory escutcheon, above parquetry inlaid cupboards. It doubled the top estimate to sell at £3000. 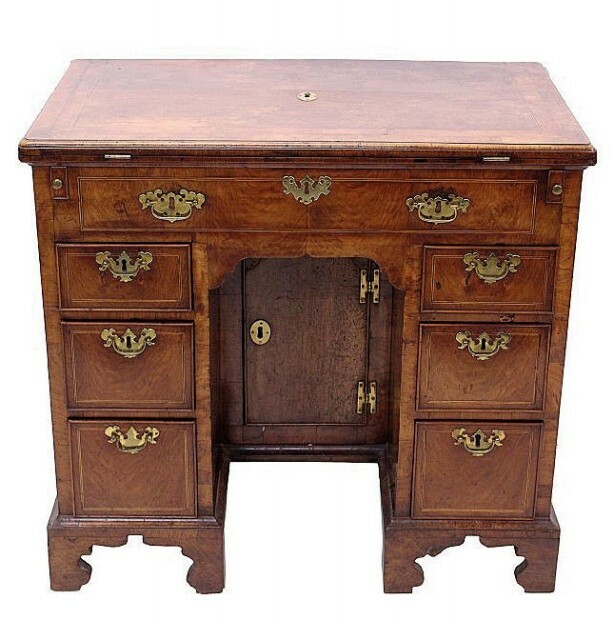 The 2ft 9in (85cm) wide desk had a hinged fold-over moulded top enclosing a fitted interior with secret drawers accessed by a sliding panel to the faux drawer frieze. “It was very unusual and probably built by an estate carpenter, but was of fine quality,” said Wright after it went to the London trade at £3700 against an £800-1200 estimate. 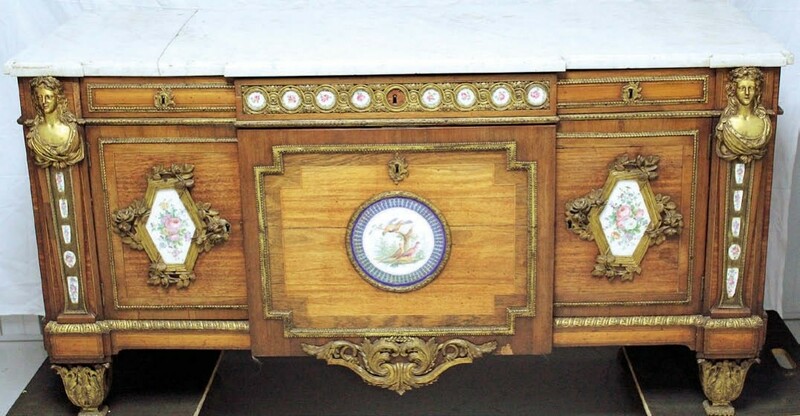 Furniture comprised only about 12% of the 135-lot sale, which enjoyed an 84% success rate and a total of £488,000 pushed along by more than 1500 online bidders over the three days. 19th century Naples porcelain dish – £3000 at Reeman Dansie. Ceramics made a significant contribution at Reeman Dansie, most notably the c.1725 Meissen teapot and cover featured in the news pages of ATG No 2330 which took £14,200 against a £1000-1500 estimate. 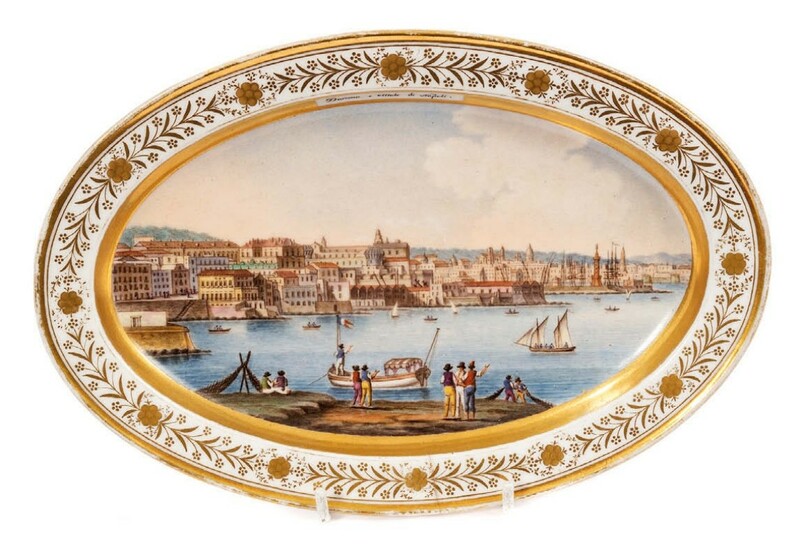 Another piece to demolish the estimate was an early 19th century porcelain dish painted with a view of Naples and titled Darsena e molo di Napoli. The 9½in (24cm) wide plate with a crowned N mark had a couple of cracks to the rim and two star cracks to the base as well as some wear to the gilded border. However, against a nominal £60-100 estimate it went to the Italian trade at £3000. Another piece of Meissen to do well was a 16½in (62cm) 19th century production of Kändler’s goat-riding Count Brühl’s Tailor. A hairline crack and some restoration kept the estimate down to £1000-2000, but it sold to a Czech dealer at £8500 – a good example of what the internet has meant to UK auctions. Another Czech was among the online bidders – a private buyer who went to a mid-estimate £4200 for a 19th century eight-day regulator longcase signed to the 13in (33cm) circular dial by Cumberland maker W Gibson Aspatria. With a four-pillar movement and Harrison maintaining power in a 6ft 4in (1.92m) tall mahogany case, it lacked its weight but came with its door key and winding key. Coincidentally also fetching £4200, this time from an English private buyer, was a rare Regency miniature table-top regulator. In a 21in (54cm) tall, figured mahogany case, it had a six-pillar chain-wind movement, deadbeat escapement and Harrison maintaining power and was signed Thos. Drew London to the 6½in (16.5cm) circular silvered dial. Qianlong metal and jade box – £9200 at Reeman Dansie. At a sale when bids were coming in from round the world, it was a Chinese buyer who provided the high-selling sleeper, as is so often the case. This was a late 19th century plate and enamel box. Measuring 4in (10cm) wide, it was decorated with cloisonné-style decoration but the draw was the lid inset with an engraved jade plaque inscribed with (probably) one of Emperor Qianlong’s proverbs. Catalogued as possibly of the period (1735-96), it was estimated at £100-150 but sold at £9200.